I really loved drawing Pipe-Smoking 1950s Dave with Horn-Rim Glasses, to the point that I used him again in a later Sunday feature. I like the way Dave looks with visible eyes. Shame I ended up structuring the entire strip so I couldn’t draw him that way until the very end. This strip comes out of my intense love for old instructional classroom films. I’ve got a bunch on DVD and multiple books on the subject; Mental Hygiene by Ken Smith is my favorite. This was the greatest contest ever. How I won the “Spot the Non-Dave” contest. 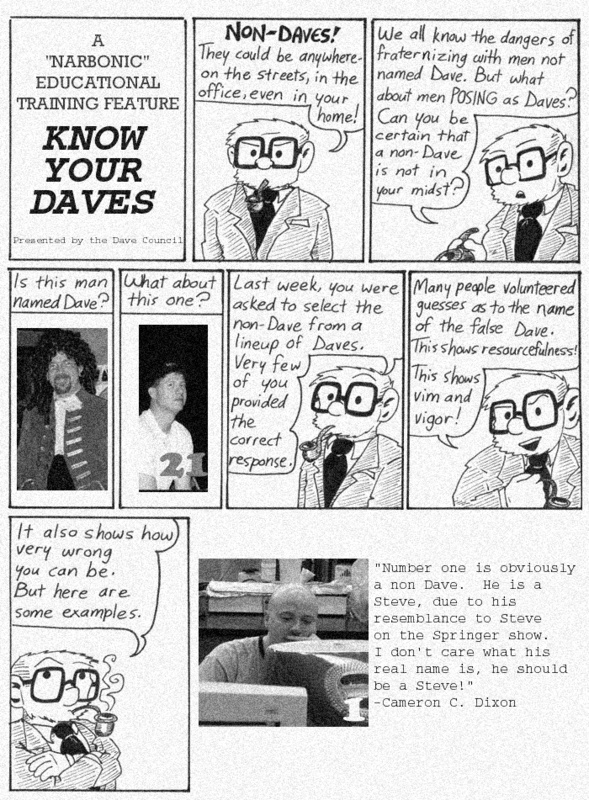 I had been reading Narbonic long enough by this point, to understand that Shaenon wasn’t above using her strip to “rip” on people, (look at the photo she included a few weeks ago of Dave Barker). I reasoned, rightly or wrongly, that she’d try that same thing with this contest. 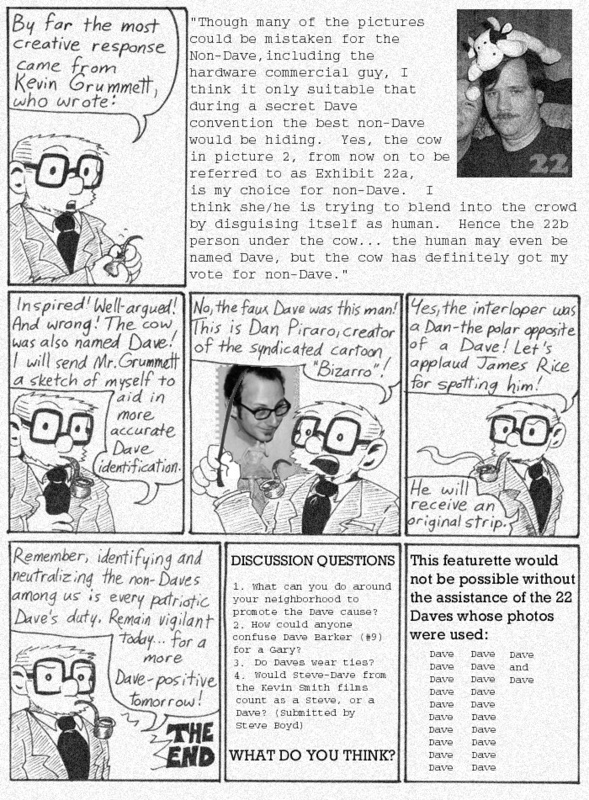 That led me to reason that that the non-Dave photo would be of a possible compromising situation, and that all the rest, sent in by readers, would be “relatively normal” photos. So rather than analyze the “Daveness” of each subject, I analyzed how each person in the photo’s might react to seeing their photo on the strip. Basically, I changed the contest to “Spot the Vendetta”, and that seemed to lead directly to photo #6. I may have been completely wrong in my reasoning, but hey, I got the original strip, so either way, it’s good. The strip I requested, was the one of Artie, trying to push Dr. Narbon’s box of wine. Unfortunately, Shaenon accidentally sent me the strip from 2 days before, of Artie hitting Dr. Narbon’s shoe. She offer to replace the strip, but I turned her down saying I’d get the correct original from her eventually. Sooner or later I did, and both are framed and hanging in my lab. Yes, the secret to victory lay in the realization that I’m a cruel and petty person. Good work, James! After this ran, the people who sent in the cow photo wrote to assure me that the cow was not actually named Dave. I made that part up. Do you remember the cow’s name? What’s really weird to me is that two of the people whose guesses were printed in this were named Cameron. You implied that it was a male cow! Do you have no shame? I don’t think you can tell from the photo whether the bovine is a cow, bull or steer. Besides which, there is (pace Dave Gorman) no actual rule that you must be male to be called Dave. The Dave Conspiracy might disagree, but I stick to my argument. Actually, there was a best-selling novel about a woman who tries to become a Dave. She feels that there is a Dave deep inside her, and seeks all over the world for the legendary secret that will bring out her inner Daveness. I refer, of course, to “The Dave In She Code”. Then again, that was written by a Dan, so it may be a subtle ploy to discredit all of Davedom. When a cow (or cow-like creature) is found wandering along the road where I grew up, the police refer to it on the radio as a “bovine”, presumably to avoid mis-classifying it. He truly knows how to dish out the PUNishment. Also, even by my admittedly pun-heavy standards, DAMN Ed Gedeon, that was slickly done. I would have gone for a somewhat raunchier, 2005-2006 era spoilerier (NOTE: not a word) joke, if I had thought of the same punchline. I’d have gone for the lady poking her head in at the left of the Cave-With-Cow picture, myself.